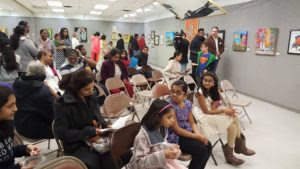 This is the first year that Irving Art Association has sponsored a juried Indian Folk Art exhibition. Last year we held our first exhibition devoted to Indian Folk Art, but it was nonjuried. It was such a success that we decided to hold a juried version. This year 31 artists from the North Texas area submitted 57 works related to themes around Indian culture and heritage. The exhibition continues through February 23rd at the Jaycee Park Center for the Arts in Irving. The Reception & Awards Ceremony was held on Sunday, February 11th, from 2-4pm, and was well-attended. Reception photos will posted soon on the IAA Photo Album. See http://irvingartassociation.org/2018/02/winners-of-the-iaa-indian-folk-art-juried-exhibition/ for the Winners Gallery.